A friend recently did a facebook list of the ten most influential books that had the most impact on his life, and he tagged me in it. This got me thinking. I found it hard to identify ten influential books. I firmly believe that every book you read is an influential book and has some sort of impact on your life. One of the issues I have is that I’ve read a lot of books. I’m reading 50-60 books a year just now. I read more before the internet. Doing an OU degree also cut down my reading rate. In 2012, just before my daughter was born, I gave up my study for her bedroom. I filled over 20 crates with books to keep, the ones I thought that I might re-read or refer to later. I gave away 1,200 fiction titles to charity, all of which I had read. Out of thousands of books it is very hard to pick just the ten most influential books. Here are some representatives that might do justice and that others might find as influential books. A Crowd is Not Company by Robert Kee. (A classic POW story, I read it along with They Have Their Exits, the Colditz Story and the Wooden Horse). All of these influential books teach you that you shouldn’t give up, no matter how bleak it looks. On Representative Government by J.S. Mill – I studied this while doing political economy at university to make up points to complete my degree. At the time I had no intention of becoming a civil servant, however it was good training for options appraisal. Psychology by Gleitman – another of my university textbooks, although detailed it assumes little prior knowledge. Psychology has probably been the most useful thing I have studied at any point in my life. I’ve used the insights it has given me to be better at my job. Always allow people a face-saving way out. Predictably Irrational by Dan Ariely – a fab summary of experiments that show how our brains work and how you can harness that. Similar works are Nudge, Fooled by Randomness and the Black Swan. Freakonomics by Steven D. Levitt & Stephen J. Dubner – looking for long-term explanations of phenomena rather than the short-term ones. It really opened my eyes to the bigger picture and thinking about consequences. Entertaining too and an easy read. There is a sequel and The Undercover Economist is ace on this too, you should read them all. The Guns of War by George Blackburn – another catch-all, but Blackburn’s book is one of the most detailed. I’ve read lots of first hand accounts of the British Army at war, I have several shelves of them. Although the single book doesn’t on its own change your mind, the collective whole does. One story is an anecdote, 200 stories becomes qualitative data. Of note are the stories by men who were all in the same place at the same time, and you don’t realise this until later on, because they all tell it quite differently. See also Field of Fire by Jack Swaab, another Gunner. Good Strategy, Bad Strategy by Richard Rumelt – along with Mintzberg’s Strategy Bites Back, this helped me get my head around what I was doing at work and understand strategy and strategic thinking better than I had before. It also gave me something to point others at if they wanted to self-educate. Government Service Design Manual – not really a book, but it changed how I approach things at work. Some really good things in there, and much of it is applicable to more widely. Guards! Guards! by Terry Pratchett. Really the whole Discworld set, they’re all influential books. I chose Guards! Guards! because it is one of the earlier Discworld books that seems to be about the setting and not a parody of something else. All of Pterry‘s work is very well observed and makes you think about how people are. Vimes and the witches especially. They’re both deeply cynical and deal with the darker side of life. There are belly laugh moments too. It’s great stuff and I wish I could write half as well. Player of Games by Iain M Banks. Again, this is really about the work of Iain Banks, with or without the M. The Culture books are a philosophical debate about how more advanced civilisations should interact with those less advanced. The books are multi-layered and make you think as well as entertain. Player of Games is a good introduction to this, and stands the test of time. One thing you might notice is that few of those listed above are reviewed here. How can they be my most influential books if I haven’t even bothered to review them? The answer is simple. Mostly I read them before the internet. With only a couple of exceptions (which are reviewed on the blog) I read them before I developed the habit of reviewing nearly every book I read. There’s not much glory in the life of a witch. 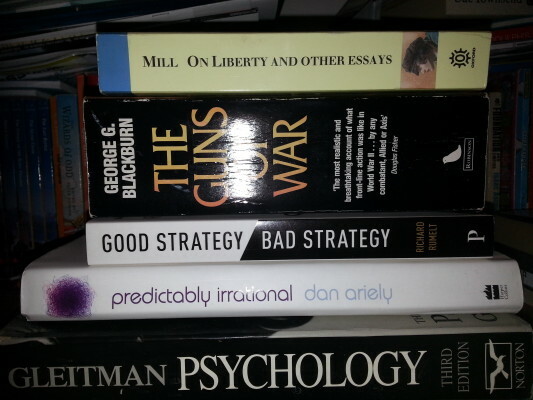 This entry was posted in reviews, themself and tagged Dan Ariely, Freakonomics, George Blackburn, Gleitman, Iain Banks, John Stuart Mill, Psychology, Richard Rumelt, Robert Kee, Stephen J. Dubner, Steven Levitt, strategy, Terry Pratchett by James. Bookmark the permalink. ← Previous Previous post: Refugee Crisis – How Can We Help? Next → Next post: The Secret of Success or Snake Oil? On not blogging - Themself on Startegy – or just getting stuff done? James on Brexit – what will the European Union do? Copyright © 2019 Red Leader. All Rights Reserved.